I have a new favorite cookie. If you didn't know by now, I'm a bit of a chocolate lover. Did you catch the name of these cookies? Yeah, that's right. Triple chocolate. Really quadruple chocolate if you count the chocolate in the peanut butter cups. Oh yeah, did I mention the peanut butter cups?? These puppies are chock full of them. I also threw in a generous helping of M&M's for good measure. Just to be safe. 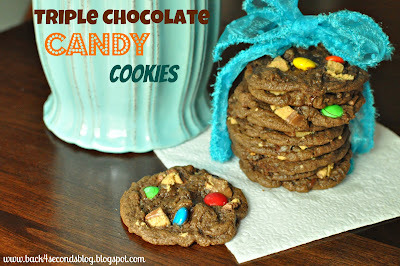 These cookies are so soft and chewy and they're just bursting with chocolate and peanut butter! If you could only eat 2 kinds of candy for the rest of your life what kinds would you choose? I would have to pick M&M's and Resees peanut butter cups. Eating those could never get old, right?? PS: As my new best friends, I want to share some exciting news with you! 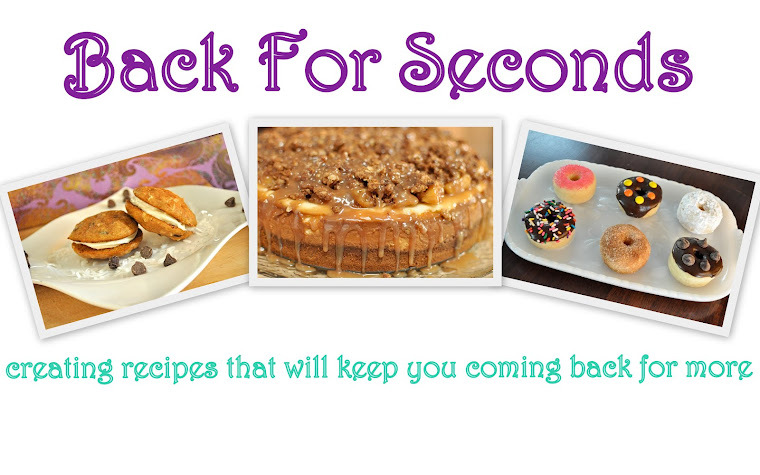 Back For Seconds now has slots available for advertising!!! If you want to spread the word about your awesome blog, shop, or business, I want to work with you!! I am super stoked and can't wait to advertise for you! I already have a few spots filled, so get yours soon to ensure prime ad space! Check here for more info. Now, let's bake some cookies! In a large bowl beat butter, peanut butter and sugar until fluffy. Add vanilla, coffee and eggs and beat until incorporated. Gradually add in the cocoa, flour, soda and salt and mix well. 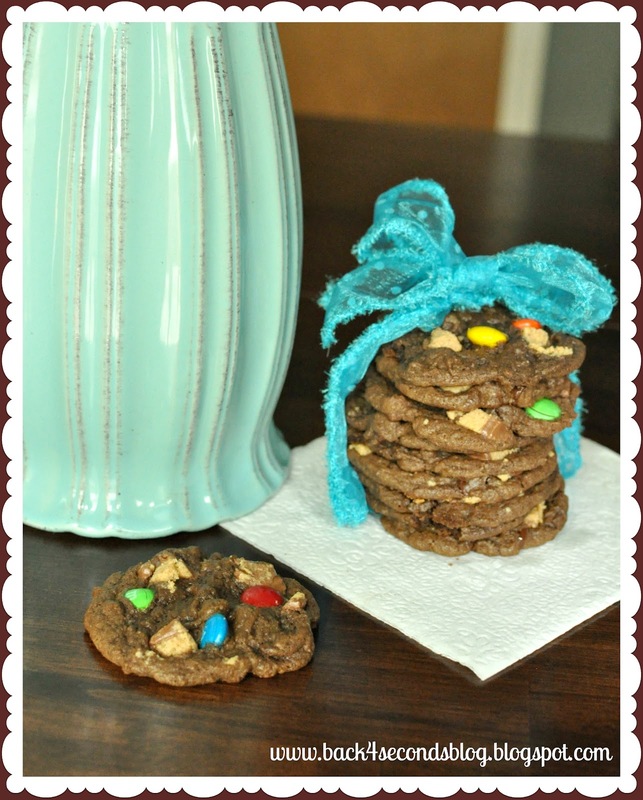 Stir in chips, M&M's, and peanut butter cups by hand. Drop by spoonfuls onto ungreased cookie sheets 2" apart. Bake for 7-8 min. Cookies will be soft. Let cool on sheet for 3 minutes then transfer to wire racks. #2 Soft and chewy all the way! I'll even give those wrapped up cookies at stores a squeeze just to check their softness before I'll buy one. How fun! Definitely a chewy cookie. And my candy of choice would be Reese's and almond joy. Love these cookies. I could live on them! Oooh, triple chocolate and stuffed to the gills with candy?! You know me too well :) although my candy of choice HAS to be Almond Joys. And licorice--I freaking adore the stuff! As for cookies, anything goes, but like you, I love me my soft & chewy ones. Dude, you totally rock. Hmmm, only two candies??? I'll probably be the odd-ball out here, but I'm going to choose Baby Ruth and black licorice. Yep, I'm weird. And definitely a chewy cookis. All.the.way. I wish I could pick Reese's peanut butter cups because they are a favorite of mine, but I have developed a nut allergy in the last 10 years and can not eat them! :( Sympathy, please!! lol Soooo, my new favorite candy is Simply Caramel and I always love Twix! Oops, forgot to mention, I prefer the soft and chewy cookies. 2) soft and chewy ALL THE WAY! Peanut Butter cups in cookies! I think you are my new BFF!!! Thanks for sharing, no I mean it, for sharing, as in send me some, please? Holy yum! These look delicious! And only 2??? Yoikes! Snickers and peanut butter cups. =o) And chewy! Always chewy! those look amazing!!! can't wait to try it! My mouth is watering while I read this post! Those look delish! Thanks so much for sharing at the Pomp Party! Pinning to our Pomp Party board! Yummy! Can't wait to try these! I'm a new follower! Would love for you to check out my blog as well! Oh, these sound incredible! My husband would be a big fan of these cookies. Thank you for sharing this recipe with us at our Summer BBQ Bash! Yum. These look so so delicious. They would be gobbled up so quickly at my house. Thanks for sharing them. Come and visit us. We have some wonderful picnic recipes this week. These look amazing ! And so simple to make too. Cookie jackpot !